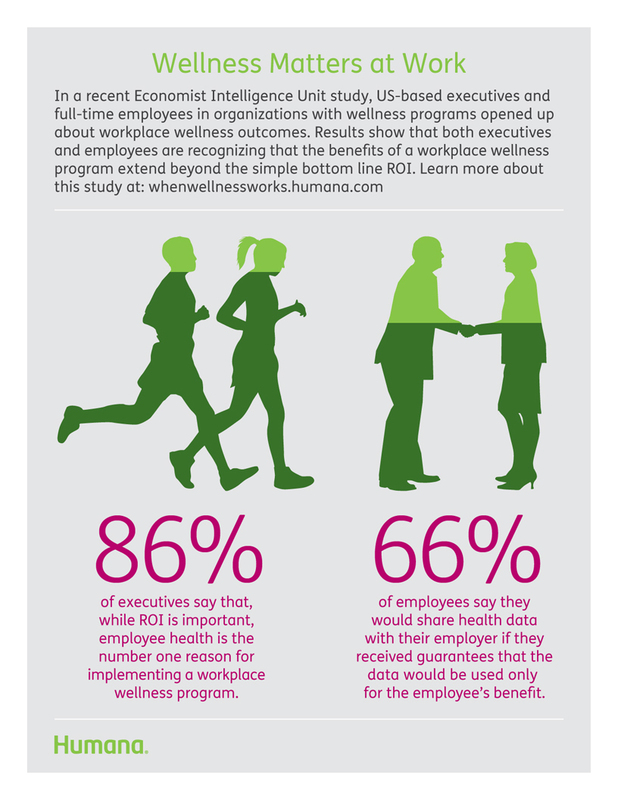 "With the right tools and framework, wellness programs can provide a valuable opportunity for both employers and employees to measure wellness and track health progress." 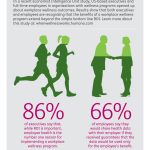 LOUISVILLE, Ky.--(BUSINESS WIRE)--Employers are looking beyond ROI when they implement workplace wellness programs according to a study released today by Humana Inc. (NYSE:HUM) and the Economist Intelligence Unit. The study, entitled “Measuring wellness: From data to insights,” explored why companies implement workplace wellness, how data influences these programs and identifies obstacles that inhibit program participation. Conducted by the Economist Intelligence Unit and sponsored by Humana, the study surveyed 225 U.S.-based executives and 630 full-time employees from organizations with workplace wellness programs. Study details are available at http://whenwellnessworks.humana.com/. Yet, despite employers’ positive sentiments about workplace wellness programs, many companies struggle with how to successfully execute them and measure their value. The study found that two-thirds of executives feel data collection and interpretation is the biggest challenge confronting effective workplace wellness. Executives feel this challenge is further hampered by reluctance from employees to share personal information or authorize data collection from third parties. Nearly 70 percent of executives consider their organization’s wellness program to be cost effective, even though not all of the outcomes are measurable. While 86 percent of executives say improving employee health as an indirect driver of productivity, morale and engagement is their top reason for implementing a wellness program, cost factors are still important, including reducing employee health care costs (66 percent) and controlling medical claims (48 percent). About 30 percent of employees rate subsidized gym memberships, onsite health and wellness facilities, and budgeted wellness activity time during business hours, as the three most important services that would motivate participation. 64 percent of employees have used fitness devices to monitor health and capture data, but only 19 percent use them regularly. The Economist Intelligence Unit (EIU) is the world’s leading resource for economic and business research, forecasting and analysis. It provides accurate and impartial intelligence for companies, government agencies, financial institutions and academic organizations around the globe, inspiring business leaders to act with confidence since 1946. EIU products include its flagship Country Reports service, providing political and economic analysis for 195 countries, and a portfolio of subscription-based data and forecasting services. The company also undertakes bespoke research and analysis projects on individual markets and business sectors. More information is available at www.eiu.com or follow us on www.twitter.com/theeiu.